From the moment they laid eyes on a 1989 Mariner Blue Mazda Miata, Cyndee Boyvey and Al Brown became hooked. At the time, however, they were in the midst of raising children, making the two-seater not the most practical choice for their lifestyle. 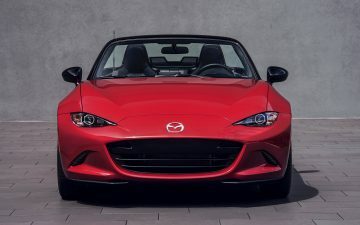 Six years later, with one kid out of the house, the MX-5 still had not left their minds. They headed to the dealership and purchased a 1995 MX-5, which they affectionately named “Wild Blu” with the license plate WLDBLU1. Twenty five years after their first MX-5 purchase, Al and Cyndee have since owned two other MX-5s: a 1992 yellow MX-5 named Yellow QT For Two, with a license plate that read Y-L-O-Q-T-4-2, and a red 2008 PRHT MX-5 named Roobee, with a license plate that read R-O-O-B-E-E. The couple says picking a favorite is impossible; each has their own memories, quirks and overall uniqueness. Cyndee and Al were first introduced to other MX-5 Miata owners during their first excursion with Wild Blu. The couple drove to the Rock & Roll Hall of Fame as part of an event hosted by Cleveland’s local Miata club. MX-5 owners were granted access to the museum two weeks prior to the grand opening. As soon as they got back to their home in the suburbs of Chicago, Al and Cyndee joined the Windy Cindy Miata Club. Alongside other club members, the couple enjoyed participating in numerous events, with the highlight being a road trip in 1999 along Route 66, down to Dallas, Texas. Today, Cyndee and Al belong to the Villages Miata MX-5 Club in their new home state of Florida.